Lots of Fun for All Ages!! 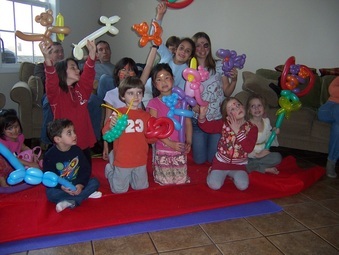 Balloon Artists are great for all parties of all ages. Getting a balloon sculpture is a special thing to a lot of people. Each sculpture is a unique creation. This is not something someone can buy in a store - so it is really special when each of your guests get their own Balloon Art. We would love to be a part in making your party a fun time for your guests. Based in Raleigh, NC - WILL TRAVEL TO ANY AREA - Cary, NC Balloon Artist; Durham, NC Balloon Art; Chapel Hill, NC Balloon Animals; Greensboro, NC Balloon Sculptures; Charlotte, NC Balloon Artists. SC Balloon Artists, VA Balloon Artist, FL Balloon Sculptures, GA Balloon Animals, TN Balloon Twisters, OH Balloon Artist, and beyond! Thank you for considering us for a Balloon Artist for your event!